In the last post I talked about the Prospect House, an amazing hotel constructed in the middle of the Adirondack Wilderness in 1882. 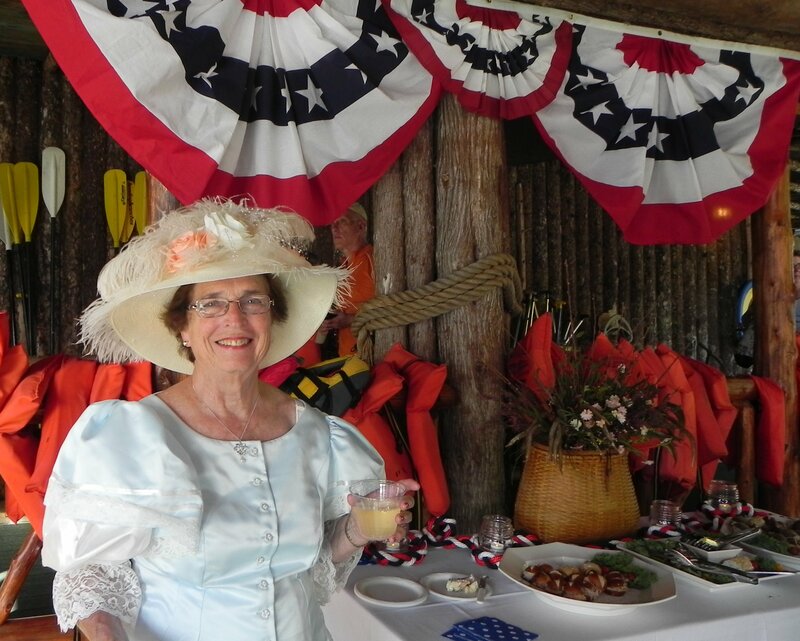 The owners of Prospect Point Cottages, David and Paul, decided to reenact a celebration held in the summer of 1882 in honor of the Prospect House. 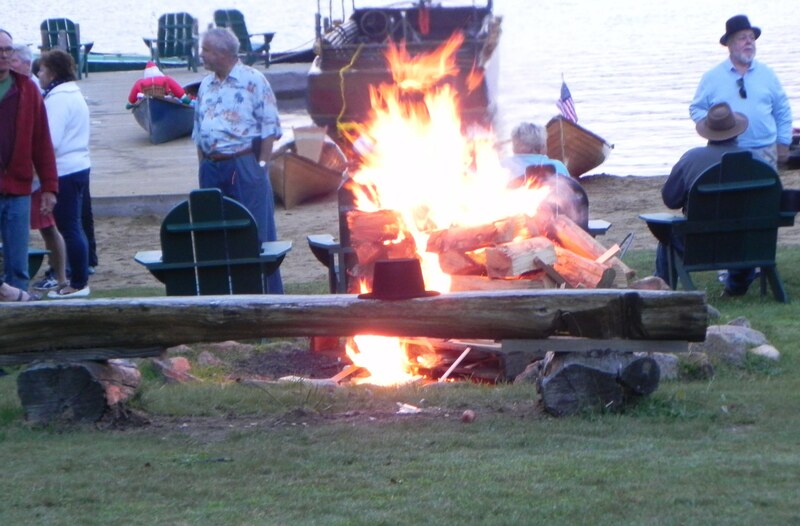 The original celebration was a flotilla of over 70 small craft drawn by a steam boat that circled the Lake. Each boat was lighted by Chinese lanterns or other means to give a stunning visual effect. David and Paul planned a number of gala activities for Flotilla Day. The event was truly a “happening” as you will see. The day started by getting our Old Lady guideboat, the Frances C., on her trailer and hauling her to the Blue Mountain Lake boat livery. 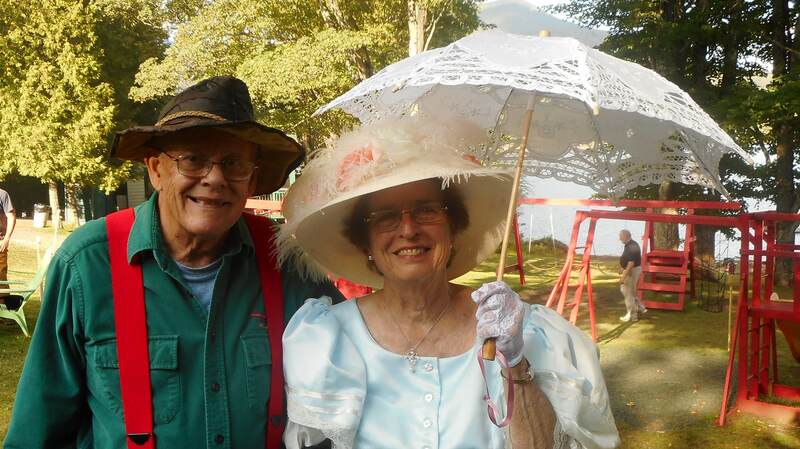 Fran and I were both in 1880’s garb, Fran in Victorian dress and me dressed as an Adirondack guide. After dropping Fran at Prospect Point, I rowed Frances C. over to the Prospect Point beach. Here she is. Our guideboat, Frances C. on the Prospect Point beach. The first of the day’s activities was was to partake in a bounteous feast of H’0rdeurves and various beverages including Champagne. This was held at the nearby resort, the Hedges. The Hedges goes back to the same era as the Prospect House, the 1880’s. Here are photos of some of the guests enjoying the food and drink at the Hedges. 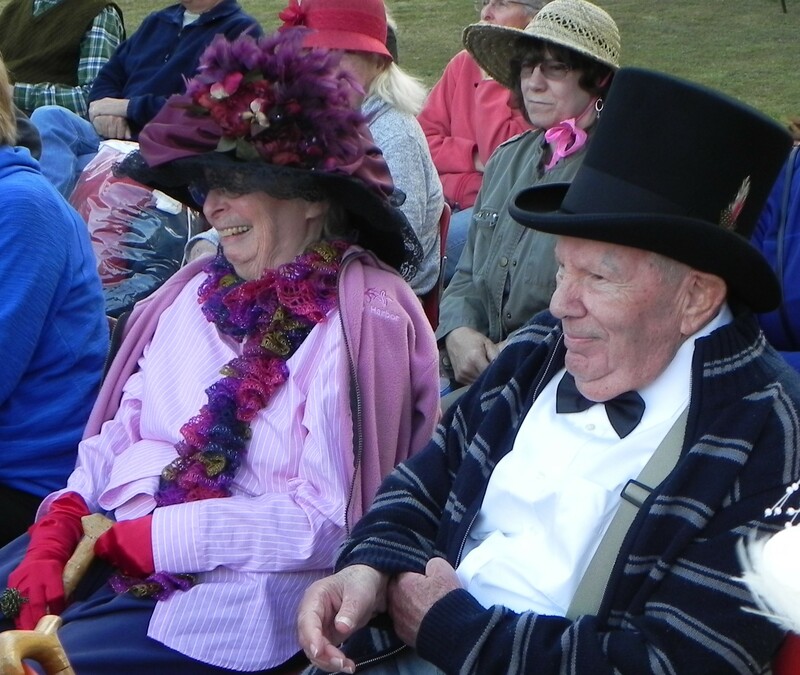 Guests, some in period costume, enjoying the offerings at the Hedges. Fran has a sip of Champagne at the Hedges. Fran enjoys a sip of champaing at the Hedges. 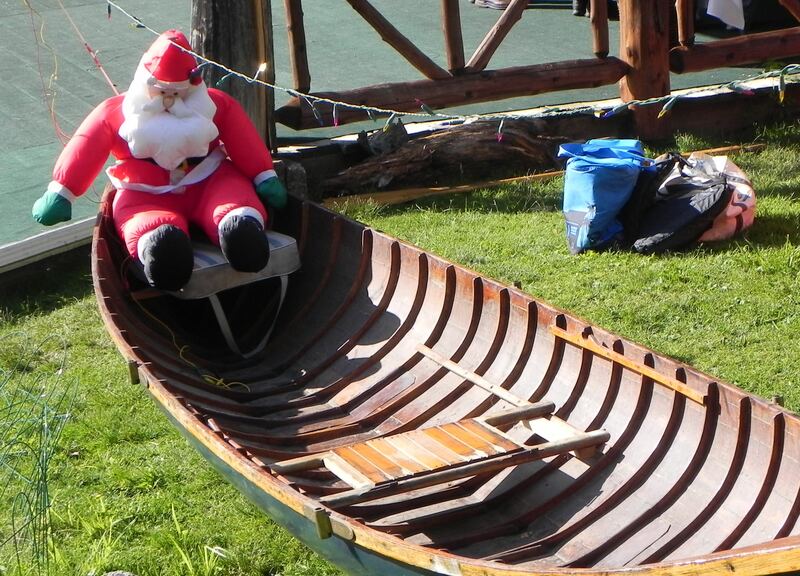 I noticed that Santa had arrived early and had taken possession of a guideboat. Later on in the afternoon we were treated to a delicious chicken barbecue. After dining, David introduced his parents. He explained that his parents had been coming to Prospect Point since right after WWII. The boys began coming when they were very young. When the cottages came up for sale in 1952 the older Oestreichers decided to purchase the cottages. This, despite the advice of relatives who said “We’re from the Bronx, we don’t fix stuff”. Below is a photo of Mom and Dad Oestreicher, David and Paul’s parents. They got a large hand from the crowd. Mom and Dad Oestreicher, who bought Prospect Point Cottages in 1952. Before going further I must show you a photo of Blue Mountain. She really was blue that day. Blue Mountain as viewed from Prospect Point. 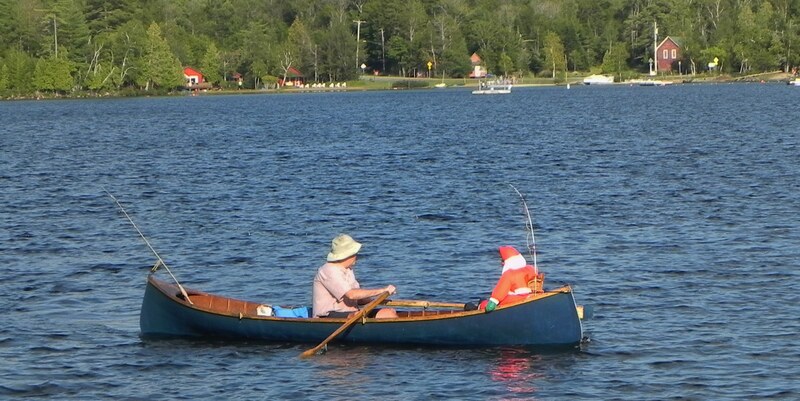 Well, by golly, Santa decided to join the Flotilla. Santa arrives at Prospect Point. He wants to be a part of the Flotilla. Now the day has flown by and darkness is not far off. 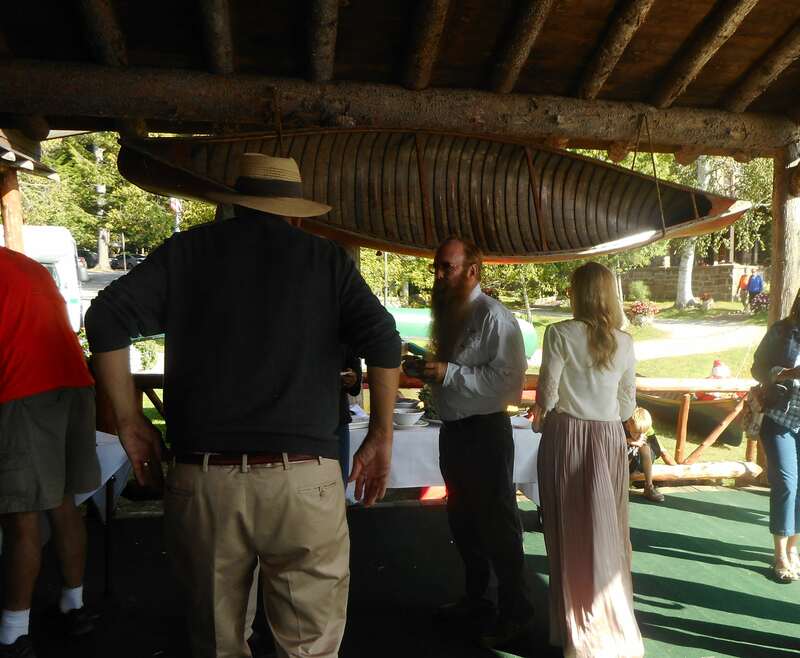 The cannons have been firing from time to time but we still need the orchestra to serenade us and Hallie to give her talk on the history of boats and boating at the Prospect House. A cool breeze has sprung up off the Lake which causes some shivering on Fran’s part in her light costume. We are not sure how the orchestra and concert pianist will fare under these conditions but they do a marvelous job. After the concert we adjourn to a tent where Hallie gives her delightful rendition of the history of Prospect House. You have gotten pieces of her story if you read my previous post. Here is Hallie, in partial darkness, giving her talk. She won the prize for the most authentic costume. 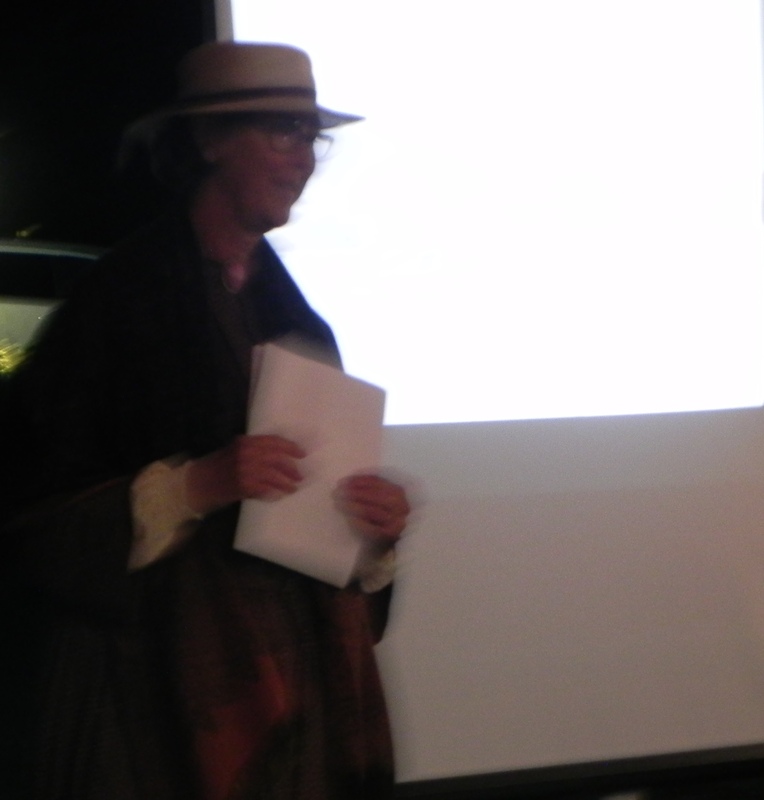 Hallie Bond giving her talk on boats and boating and the Prospect House. Now it is getting quite dark and chilly. Thank goodness the organizers had planned a bonfire. It took some of the edge off the chill. A bonfire takes some of the chill off. 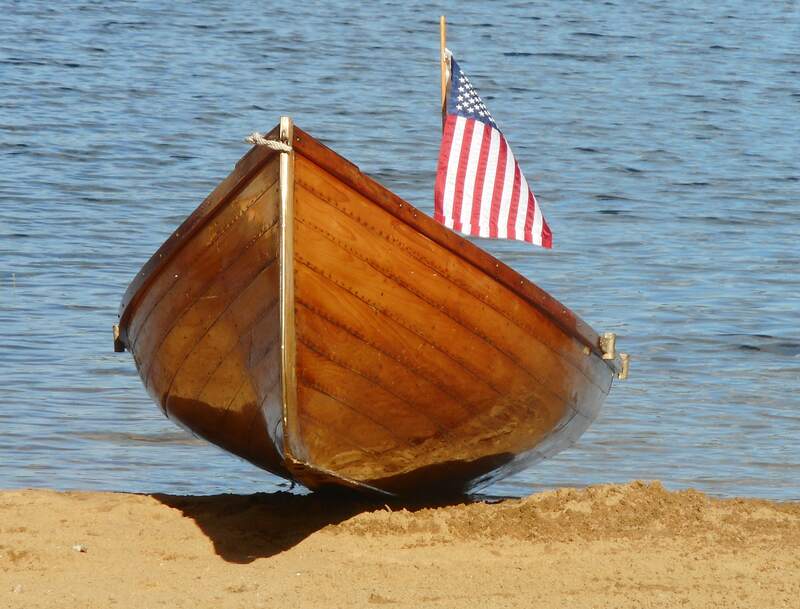 The Flotilla was supposed to start at 6 pm. It is well past that and getting really dark. This will add to Fran and my travails as we attempt to join the Flotilla. More on that next time.